When I stumble onto a recipe that works every time, I stick with it and rarely change either ingredients or instructions. 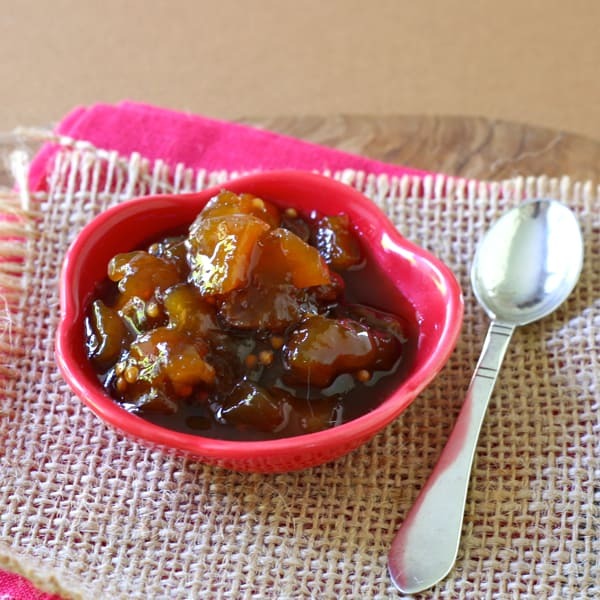 My mother’s mango chutney is one of those tried and true recipes that I make over and over, usually in summer, stashing some for food gifts during the holidays. When I assembled everything to make my most recent batch, including the mangos at the peak of ripeness, perfect for chutney-making, I discovered my sugar bin was completely empty. Too lazy to run to the store, I spied an unopened bag of organic dark brown sugar from Trader Joe’s. On an impulse, I subbed the brown for the missing white sugar. Before canning the chutney, I sampled it, bracing for the slight tartness from the vinegar, a taste that mellows once the chutney “rests” for a couple weeks. Amazingly, it tasted smooth with rich caramel undertones. Sure, the color was a bit darker, but the taste made up for it, I thought. I hate to say it, but I think Mama’s mango chutney recipe has only been improved a bit. I’m sure she would approve, and here’s the link to her original recipe. Oh, this would make an excellent gift! Liz I always loved your Moms Mango chutney but this with the brown sugar really has me wanting to make it using the brown sugar. I can just taste the rich caramel flavor with the delicious mango. Looks amazing. I’m going to try it next weekend when I make my homemade relish from Cathy Barrow’s recipe. Not as delicious as your pie posted today, Greg. Thanks, Lisa, I love that you are posting again – such great ideas…and recipes! A perfect substitution that your mother could only be proud of. Thanks, Beth – I hope she would. What a happy outcome! Your chutney sounds so good! One day I may get to make chutney again, will keep this recipe in mind! I will try to bring you some in my suitcase when we visit – thanks, Jayne!